Choose A High Content, Motivational Speaker Who Will Make You Look Great and Inspire Your People to Leverage Optimism to Make Change Work! Terry Paulson is a PhD psychologist and a leading authority on change management and in turning positive psychology research into practical insights that produce real-world results. He’s a national columnist and author of the book, The Optimism Advantage: 50 Simple Truths to Transform Your Attitudes and Actions into Results. He’s brought us practical, easy-reading insights in books such as They Shoot Managers Don't They, Leadership Truths One Story at a Time, Making Humor Work, and Speak Like a Pro. For more than 30 years, Dr. Paulson has been helping audiences transform their self-limiting beliefs into self-fulfilling breakthroughs to achieve their personal and professional goals. Terry will motivate your audience through his unique and memorable personal stories and engaging humor, teaching them leadership and life lessons that they can use for years to come. He will help your people transform challenges into choices, obstacles into opportunities, and setbacks into stepping stones to success. Terry programs on optimism and change leadership have touched thousands, around the globe through his live keynote programs and online ezine. Terry's presentations are more than motivational. His dynamic and compelling programs provide both the attitude adjustment and the practical strategies for organizations, leaders and teams to make strategic change work! Terry delivers more "meat" per minute in a fun way than most speaker you could hire. He moves with remarkable ease from one very different field to another, working with clients in different businesses, industries and professions. His clients include everyone from sole entrepreneurs to huge corporations. These Clients Loved Terry. You Will Too! His programs have been enthusiastically praised by thousands of executives, managers, salespeople and professionals worldwide. Terry makes sure his programs fit your organization and your situation. His unique, inspirational stories could be told by no one else. Your people receive a program, that's fast-paced, fun, and relentlessly packed with usable information they put to work right away.  Hosted ECI's business television series entitled, "Quality from the Human Side" and a frequent guest on radio and television programs as an expert on communication and leadership.  Honored to be one of seven distinguished faculty members for the Institute for Management Studies, conducting top-rated programs for each of their 26 locations around the world.  Frequent writer of articles and columns in airline magazines, USA TODAY, The Wall Street Journal, the Ventura County Star and countless trade magazines and online sites. The list goes on and on and on! That's just the "tip" of the story behind this authority on optimism and change. Terry Is an Honored Speaking Professional! 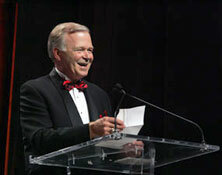 In 2004, Dr. Paulson received The National Speakers Association's Cavett Award. It is the association's most cherished award presented annually to the member whose accomplishments over the years have reflected outstanding credit, respect, honor and admiration in the association and the speaking profession. 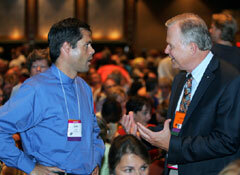 Dr. Paulson is a past president of both the National Speakers Association and the Global Speakers Federation. He has attained NSA's Certified Speaking Professional designation (CSP) and has been inducted as a lifetime member of the (CPAE) Speakers Hall of Fame, along with Ronald Reagan, Colin Powell and Norman Vincent Peale, an honor given to less than 250 speakers worldwide since its inception in 1977. Make Your Next Event a Smash Hit! 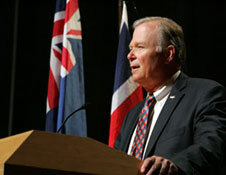 Terry's tasteful humor and down-to-earth style have earned him a deserved reputation as one of the nation's best keynote speakers. He brings knowledge, enthusiasm, and a refreshingly unique approach to every presentation. Give Terry the opening keynote and kick off your conference with a proven winner. Or have him as your closing keynoter and send your people out the door energized into focused action. Either way, your conference will be more successful, your people will thank you, and you'll look good for arranging it. Terry wants to make sure your date is available on the calendar, so get information now on how to book him for your event! Click here to watch Terry Paulson in action. Book Terry Paulson to speak at your next meeting or event! Contact: Paulson and Associates Inc.